The original seven planets were always known as the ‘stars’, that is, the ‘Stars of the Gods’. These are the most truly active agencies within the astrological system. They are the ‘light-bearers’ who ‘speak’ to us through ever-changing motion and appearances. More than anything else, it is they which offer the ‘signs’ whereby a chart is read. Thus they have been called titles such as ‘lords’, ‘significators’, and ‘promittors’. Each celestial body appeared to the eye on behalf of a particular deity. For instance the Sun was the light of Apollo/Helios, Venus was the star of Aphrodite, Saturn of Kronos, and so forth. In being a star ‘sacred to’ or ‘under the protection’ of a god/goddess each also had its own uniqueness of light. Jupiter was specifically ‘radiant’, Mars ‘fiery’, and Mercury ‘glistened’. Further appreciation of their qualities and base interrelationship were also reflected in the ‘Chart of the World’ – the Thema Mundi. This Intensive highlights the nature of the planets’ critical role. Each one’s core qualities will be explored and, importantly, ‘why’ any celestial body may symbolise what it does. There is a whole range of potential interactions they can exhibit, depending on the essential nature of each and the dynamic arrangement of the heavens. The astrological role of the ‘Modern Planets’ will also be examined. 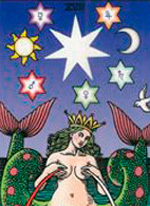 Each star is the ruler of its own essence for its sympathies and antipathies and mutual feelings in relation to the cosmos, and they have the authority for their commixtures with one in another in accordance with application, separation, superiority, containment, spear-bearing, hurling of rays, and the approaching of the masters. This intensive was first presented in Brisbane (QFA) in April 2009, on the Gold Coast (GCAS) in June 2009, and on the Gold Coast (GCAS) in revised form in September 2012.